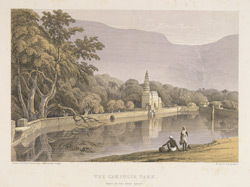 Coloured lithograph of 'The Campolie Tank' at the foot of the Bhor Ghat in Maharashtra by William Spreat (fl. mid-19th century) after an original drawing by Major Robert Pouget dated c. 1850. This image is one of a series of 'Views in India and in the vicinity of Bombay'. The Bore Ghat pass was one of the major routes through the Western Ghats, linking the sea coast with the Deccan. In the 1840s, George Clark the Chief Engineer of the Bombay Government and the Great Indian Peninsula Railway Company developed a scheme to create a reversing station here, which was opened in 1861.